Astralite plus is Brandon Medical’s latest offering; providing the best lighting solution for any requirement. Higher-intensity bright light at 1m provides 100,000 lux or 60,000 lux; providing ample light for even the most-demanding procedure. With a larger illuminated area of 195mm diameter, it makes it easy to illuminate large areas of tissue and to target the light on the wound. Astralite plus have a focus depth of 970mm to penetrate into deep cavities. Astralite plus reproduces all of the visible colours naturally and accurately. The high Ra>94 describes the exceptionally high quality of white light, while the high R9>92 measurement describes how it accurately illuminates red tissue. The Astralite plus is designed so that the light head can be positioned all the way around the couch to examine all parts of the patient. The five rotations allow easy positioning of the light beam from any angle. LED life is 50,000 hours which equates to more than 20 years of normal use. Astralite plus uses <30 Watt to produce 100,000 lux or <18 Watt to produce 60,000 lux. LEDs are mercury free; do not contain CFCs, POPs, VOCs, halogens or other harmful chemicals. Never having to change a bulb for the lifetime of the product means that Astralite plus is highly economical. LED is substantially more efficient at producing more surgical-quality light for less power. LEDs only emit cold light without any infra red, which is ideal for comfort and safety. 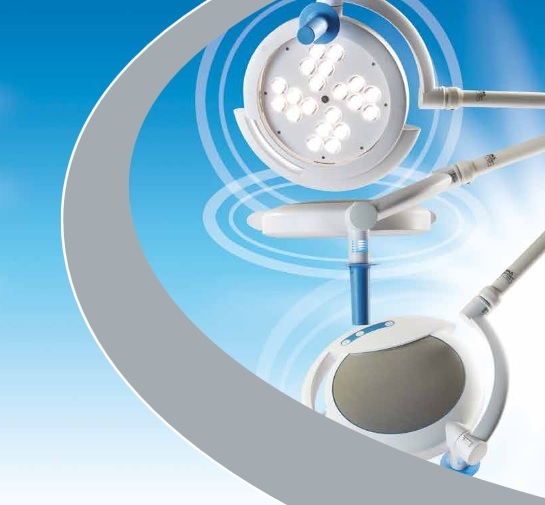 Variable intensity control is provided to set optimum illumination levels for the procedure. Intensity can be controlled from the sterilisable handle or the control panel with LED indication of the set level. By spreading the LEDs across the whole lighting surface, a much better distribution of light is provided from the lamp head. This enables excellent shadow control to under-light obstructions during procedures. Astralite plus lightheads are a closed design, sealed to IP42 against dust and moisture. Surfaces are smooth without exposed fasteners to make them easy to wipe clean.